What is a learning support assistant ? 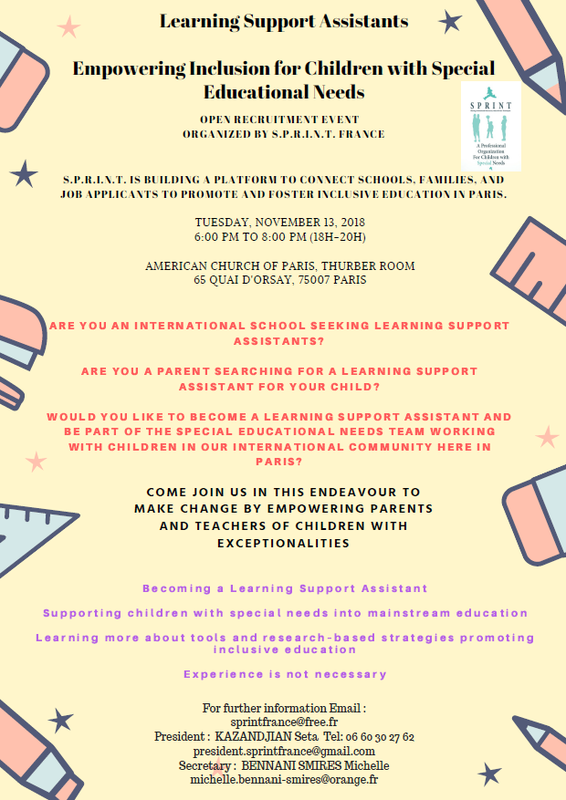 A Learning Support Assistant, also called AVS in French (Auxiliaire de Vie Scolaire), has for their main mission to accompany children with special educational needs in their school and extracurricular life. The AVS can take care of one child in particular in mainstream schools (primary, lower or high school). The AVS does not carry out teaching missions, but generaly accompanies the child within the framework of the school and extracurricular life. • in the presence of the teacher-educator referent - the AVS can support families / parents by communicating to them the new evolutions or difficulties of their child. Our project is to create a platform to connect schools, families and job applicants to promote and foster inclusive education in Paris. By networking, open recruitment events and an online platform, we will be promoting integration into mainstream education for children with special needs, sharing information and research-based tools and strategies for learning support assistants, as well as connecting parents, schools and learning support assistants. The platform is solely a tool to network and allow contacts to be made. We do not take any responsibility and we are not liable for the consequential behaviour, reliability or integrity of job seekers or families. Any screening or background checks are to be done independently by both parties. Any information shared on this platform is done so with consent by both parties. You must ensure that all the information you supply us is true, accurate, current, complete and non-misleading. You must not use this platform for any other uses other than to find a job as a Learning Support Assistant/find a Learning Support Assistant for your child/find an inclusive school.